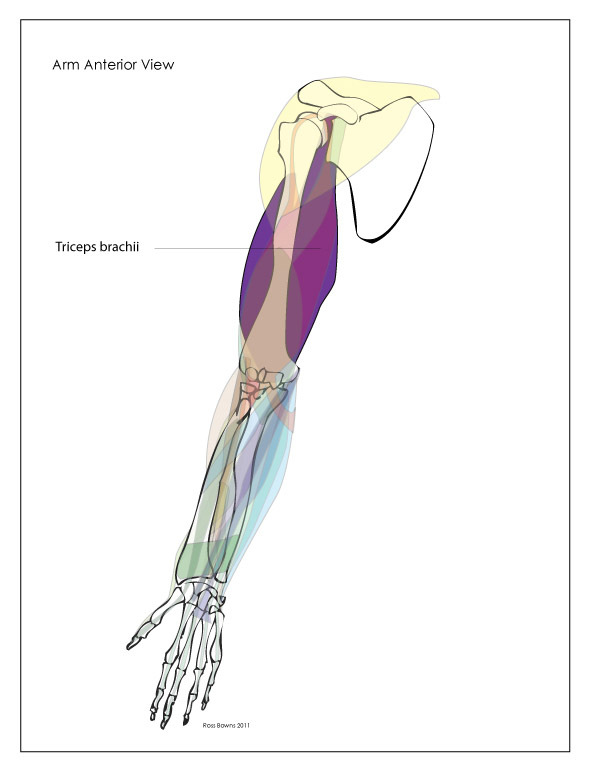 Now that I am finding the format I like to follow for the anatomy basics posts I want to revisit the anatomy of the arm to present it a little more clearly. I am looking to for ways approach the anatomy of the human form that assist in us in our drawing. Looking at the shapes and location of the muscles is a good place to start. Today, we will look at a few of the muscles found in the upper arm, including the biceps, triceps, barachialis, and coracobrachialis. We will look at the attachment points of the muscles and how these muscles move the arm. First, let me explain the images. These charts are designed to allow us to see the general shape, placement, and attachment points of individual muscles. The muscles are represented in flat simple shapes with distinct colors to highlight each muscle. I am not making any distinctions between muscle fiber and tendons right now. They are being lumped together for simplification. 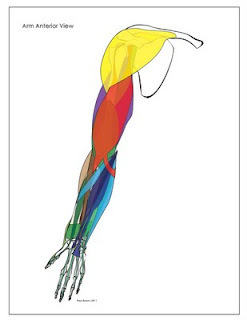 If you are interested in seeing a more detailed view of the muscles I recommend Google Labs Body browser. 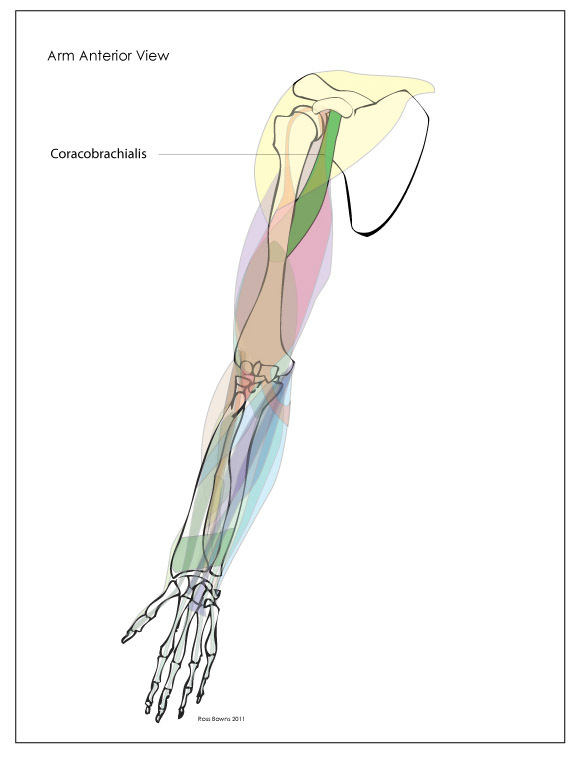 The biceps brachii is the muscle on the front of the upper arm. This muscle gets the name bicep because it is composed of two heads (bodies of muscle). 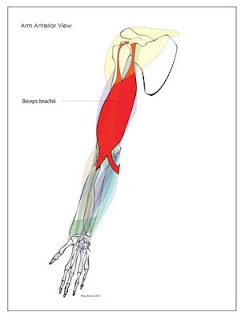 The biceps brachii is responsible for bending the arm at the elbow bringing the forearm up towards the upper arm (flexion). The coracobrachialis is a muscle that is tucked in between the larger biceps and tricipes. Though it is not completely obscured by the two. This muscle moves the arm at the shoulder, bringing the arm up and in towards the body. The coracobrachialis starts at the scapula on a protrusion of bone called the coracoid process. 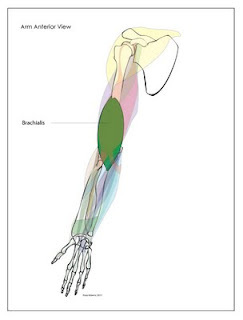 This band of muscle continues down the upper arm and attaches to the inside of the humerus. Insertion: The middle of the shaft of the humerus on the medial side. The brachialis sits on the lower half of the humerus in the upper arm and under the biceps brachii. Working with the biceps this muscle bends the arm at the elbow, bringing the fore arm closer to the shoulder. This last one is a large muscle on the back (posterior side) of the upper arm. The name of this muscle also gives a clue as to how many heads are contained within. The triceps perform the opposite task of the biceps. This muscle extends the arm at the elbow, straightening it out. The triceps attaches the scapula and to a couple of spots the back of the humerus. It spans across the back of the humerus down to the elbow and attaches to the top of the ulna. I thought I'd try something different to wrap things up. Below is a video set up to work like flash cards. 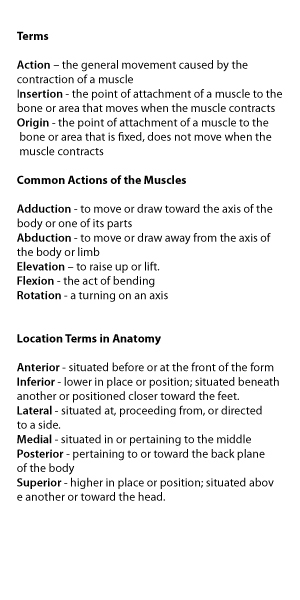 This may help you study the location of the muscles. Try it out.